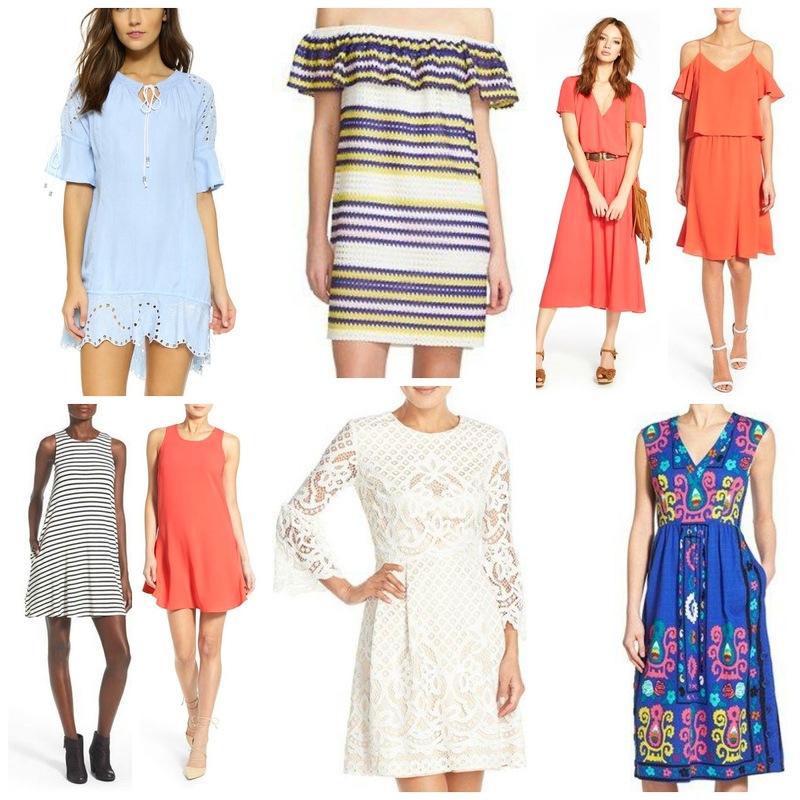 The thing I am most excited for in spring: wearing dresses! Without tights! Here are some of my favorites that I found this week. 1. RahiCali Mini Dress - I'm not the biggest fan of baby blue, but this shade almost looks like a pale chambray so it appeals to me. The detail however is what I love about this dress - the sleeves and hem make it so interesting! 2. 1.State Openwork Mesh Dress - I can never pass up striped anything! And this cute off-the-shoulder dress looks comfortable and feminine. 3. Wayf Blouson Midi Dress - I used to think that midi dress or skirts were only for those blessed with great height, but at 5'4" I have come to love the look of the midi style. This looks perfect for a weekend of shopping and brunching. It also comes in white which is ideal for early spring. 4. Cooper & Ella Cold Shoulder Dress - This looks like the cutest date night dress. And with flat sandals, a denim jacket and cross body bag is also suitable for running around during the day. 5. Socialite High Neck Dress - This dress is under $40 and looks like the most comfortable dress up here! Basic stripes never go out of style and while the model is wearing it with ankle booties, I can see it with sneakers and a denim shirt tied around the waist. 6. Chelsea28 Crepe Shift Dress - While I love a good print, it's nice to have a few dresses in my closet that feel suitable for just about any occasion. I love this gorgeous melon shade, but it also comes in black which would make it great for transitioning into the fall again. 7. Eliza J Bell Sleeve Fit & Flare Dress - I have seen this dress all over the blogosphere and absolutely adore it! The detail and shape makes it look so feminine and I can see this being a big hit for showers, easter or any occasion that calls for a more dressy attire. 8. Plenty by Tracy Reese Midi Dress - This print made me stop scrolling immediately when I was looking online this week. The blue is so vibrant and the print drew me in instantly. Again this is a dress that I can see styled with strappy sandals and a clutch for an evening out, or wedges and a straw hat for casual errands or shopping. I am working on a spring fashion favorites video very shortly so stay tuned for that! This dress and this dress that I just picked up will both be making an appearance in it because I think they are perfect for spring.